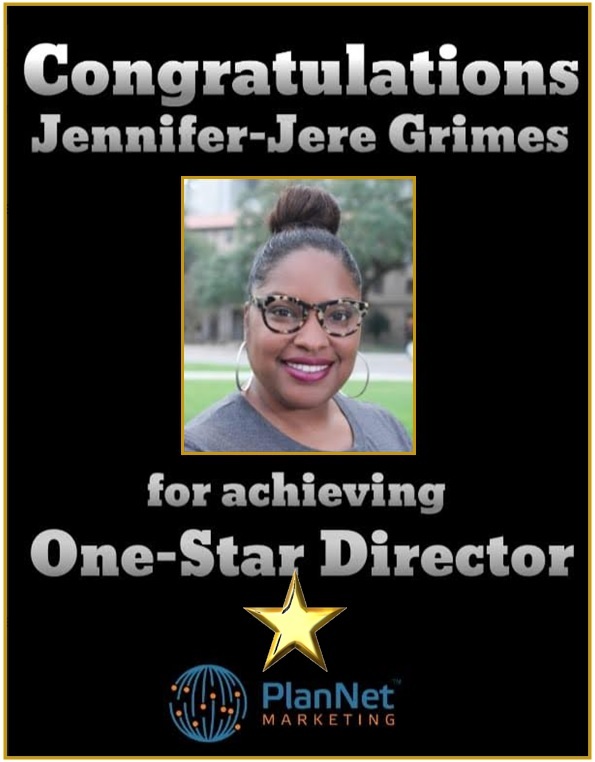 CONGRATULATIONS TO JENNIFER-JERE GRIMES FOR ACHIEVING ONE-STAR DIRECTOR AND 20/20 CLUB! PlanNet Marketing welcomes Jennifer Jere-Grimes, new One-Star Director and new member of the 20/20 Club! Jennifer is from Baker, LA, currently living in Baton Rouge. Her interests are shopping, traveling, and helping others brand their businesses. Jennifer tells us, “I am an avid traveler! My top two favorite trips would be Miami, FL and The Atlantis in the Bahamas. “I have achieved success by remaining consistent, being passionate about what I love to do, and never being afraid to discuss my business. I am also a product of my business; I travel a lot and when people see you are actually living and achieving your goals and dreams, they buy into you as the person.